Thank you for the recognition and also for allowing me to be a part of the awards night. and most of all, to the readers both here and abroad, whether its a single page view or a couple of minutes in our blog, it means a lot to me. Again, thank you. Blog on! Nice! Had privilege to hear the rehearsal speech but all the same it is well written so congrat dear! 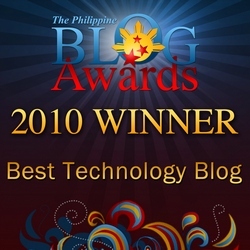 congratulations for winning the best technology blog.. cheers! Congratulations I actually found you via the awards! Congrats Sir. Sana makakuha din ako ng ganyang award. Although, hindi ako blogger sana mapansin yung mga websites na ginagawa ko para sa Pilipinas! More power sir!